BRE regulations require online-only students to log 45 hours of active reading time on the course homepage. An online reading timer tracks activity. Inactivity stops the reading timer. For online reading WITHOUT a reading timer, please choose a Multimedia enrollment. There is a $17.50 fee for upgrading from an Online-only enrollment to a Multimedia enrollment. Many students consider Package #104 to be difficult. There is a $17.50 fee for upgrading from Package #104 to another package. Get up to speed on market fundamentals and see where California's real estate market is headed. Brush up on your SFR real estate practice. A good review if you've been out of the market for awhile. Know the rules when a seller-in-foreclosure sells their home to an investor and how to structure seller financing to create more sales. Branch out into a recession-proof real estate practice, or learn the rules of managing your own rental properties. Learn how to put together investment groups to acquire large income properties and how to manage those investment properties to meet your investment goals. Learn how a commercial agent evaluates and arranges transactions on various income-producing properties for owner and investor clients. Form real estate investment groups, and create seller financing to fund the purchase of investment property. Learn about the best practices for originating, servicing and foreclosing on consumer and business mortgages under state and federal rules. 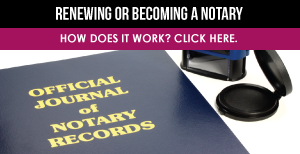 Click on the infographic to see how to obtain a new notary commission or reappoint an existing commission.